University Professor PhDr. Ján Stanislav, DrSc. studied Slavic and Romance philology at the Faculty of Arts of the Comenius University in Bratislava (1928). He studied in Paris, Krakow and Ljubljana. In the field of scientific research he focused on dialectology, Old Church Slavic, research of language and cultural conditions in Great Moravia; he applied his research also to the work of Cyril and Methodius. He also dealt with Slovak historical grammar, study of the earliest history of Slovak language and Slovaks, especially their settlement in Pannonia. 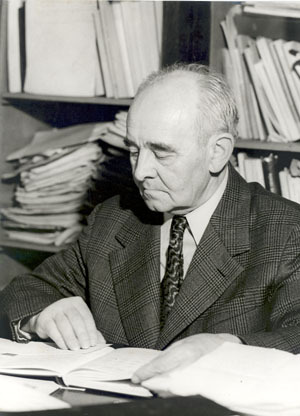 Synthesis of his scientific activity are five volume historical books Dejiny slovenského jazyka (1956-1973) that pointed to the development of Slovak language compared to other Slavic languages. One of the essential works devoted to Slovak linguistics from diachronic perspective is one particular piece Slovenský juh v stredoveku (1948) with map supplements in which he documents the historical settlement of Slovak ethnic group beyond Slovak borders. In particular, he focused on the Great Moravia, he analyzed the legends of Pannonia called Panónske legendy and examined some aspects of using liturgy in the Great Moravia. The most important work in this research area is the scientific synthesis of two volumes Starosloviensky jazyk I.-II. from 1978 and 1987. On September 1, 2005, President of the Slovak Republic Ivan Gašparovič honored Professor Ján Stanislav in memoriam by Ľudovít Štúr Order. In 2005, Jan Stanislav Institute of Slavistics recalled the 10th anniversary of its establishment. On this occasion the Slavistic Cabinet of SAS with effect from January 1, 2005, was renamed to Jan Stanislav Institute of Slavistics of the SAS. This name pays tribute and respect to the person and work of this important Slovak Slavist. On this occasion, the Slovak President Ivan Gašparovič visited our department April 27, 2005. Information about the president’s visit to our Institute is available in the News of SAS (2005, vol. 41, no. 4). In 2004, in the birthplace of Ján Stanislav – Liptovský Svätý Ján, took place an international scientific conference dedicated to the centenary of his birth.